A long and confusing walk through abondoned farms, hills, valleys, and a couple near attacks by a mad bull brought us to Old Man By The Sea. It was well worth the trek. 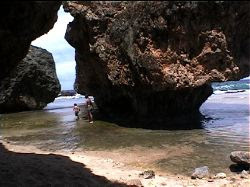 The unusual rock formations and the waves washing over the rocks were truly spectacular. 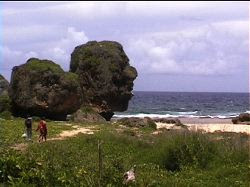 The beach got it's name from the rock which resembles a human head. I would love to go back with a better camera but I forgot how to get there. After a typhoon, we would go down to this beach and collect all kinds of glass fishing-net floaters, from Japanese nets, that had washed up from the typhoon waves. even caught an eel once in the stream that runs down the valley there to the sea. 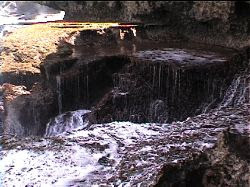 I lived on Saipan as a child and remember going to this beach with my parents. I remember treking through the boonies to get to it, and it was a great beach to collect glass balls. I have two pictures hanging in my living room of this beach, one at sunrise and one later in the morning. I absolutely love your blog and the pictures. Thanks. Wow, so cool to see that again! I remember the long trek through the boonies, hacking our way with a machete, to get there. We kids were whining all the way, but it was heaven when we finally got there. We played all day in the lagoon and found so many shells. It was a dreamscape in my mind and it is just as I remembered! Thanks so much. I was there in 91 to 94, went to middle school. Afer 1 typhoon I found a grenade. Pretty cool.